Photo Friday- Do you love Lucy? 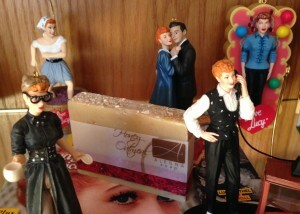 My sister Lisa has always been a Lucille Ball fan. I remember my grandmother being a fan also, and she and Lisa would sit and watch and laugh. Lisa now collects Lucy memorabilia. She has a whole cabinet in her home dedicated to Lucy. There are Lucy clocks, Lucy books, Lucy things I can’t even remember and Lucy things you never knew existed. Here is my Honey Oatmeal soap in her Lucy cabinet. It has a place of honor among the Christmas ornament figurines. I like to think that Lucy would like my soaps. Maybe she would take a job in my soap factory and wrap my soaps, like she did in the chocolate factory. The soaps would start out slow, but then pick up speed. They would soon go by so fast she wouldn’t be able to keep up. She wouldn’t be able to eat them, like she does the with the chocolate. so I wonder what she would do. Do you have any ideas?